How can you be vulnerable and still protect your most tender heart? Do you ever feel like you share too much, too soon and then end up with regrets? The power of vulnerability is something that’s been talked about a lot lately, and one of you lovelies wrote to me that you’re hearing all about how important it is to be vulnerable, but that sometimes it feels like you share too much, too soon. Today I am getting specific about vulnerability and what I call “voluntary vulnerability.” This is making a clear distinction between oversharing which is spilling all aspects of your life story and being discriminately vulnerable. I also am giving you some tools, guidelines, and practices to help you know the difference so that you can cultivate the kind of healthy vulnerability that deepens intimacy and allows you to be truly seen and loved for exactly who you are. Vulnerability itself is being willing to share yourself (even though you know you’re not perfect). It’s being willing to be seen as you are. It’s sharing the real truth of who you are with people. Voluntary vulnerability is you making a conscious, mindful choice to be vulnerable. How to decide with whom to be vulnerable and under what circumstances? 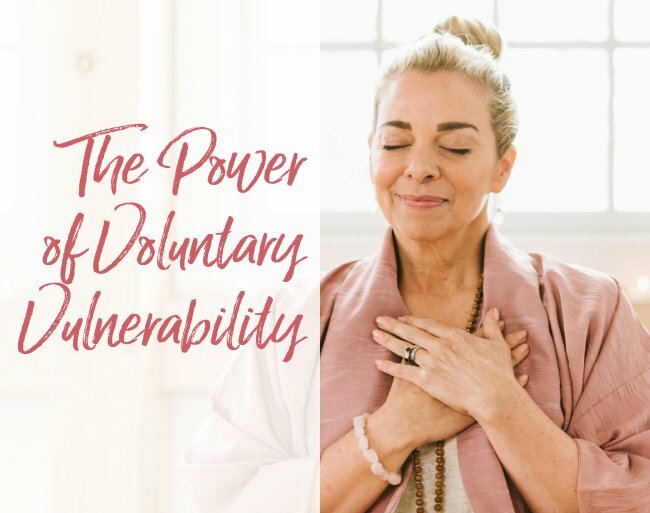 I’ve got 6 ideas to help you develop and nurture voluntary vulnerability in your life and relationships, so click below to watch the video now. Why is this so challenging? Truly being vulnerable can be difficult for anyone, but especially for perfectionists. When you feel like everything has to be a certain way or to look a certain way, revealing your human messy-ness is that much harder. True vulnerability requires a certain amount of self-acceptance and strength. Voluntary vulnerability requires those things plus mindful discernment. I say, “Maybe never.” Think about that. You always have a choice about what you decide to share with someone, and if there’s a sense that you have to confess, that’s not vulnerability, that’s having unhealthy boundaries. If you want to share something in time, that’s a different story. But if you meet someone and you spill your guts about your whole life story right away… how do you feel the next day? I call it a “vulnerability hangover”– that feeling when you’re thinking, “Oh my God, what did I do? Why did I do that?”. A perfect stranger doesn’t deserve to have access to your most tender heart. Trust is not just a given. Emotional trust is something that is earned over time when someone continues to show up and proves themselves (in both words and actions) trustworthy. I want you to imagine this space of voluntary vulnerability like the VIP section of your life. Everyone doesn’t get the VIP All Access pass, right? You get to decide who belongs in there. They don’t just get to show up. You don’t owe anyone anything. You get to decide when, how and with whom you open up your most tender heart. The people you decide to share with should be those with whom you’ve built mutual, loving trust. Gather evidence that they are trustworthy, and that they won’t belittle or judge you. Are they empathetic listeners? Do you feel better after having a conversation with them? Is there a mutuality in what you share with one another? Learn to discern. Raise your self-awareness around why you want to open up to someone. Make sure that you’re not sharing to seek attention or because you crave instant intimacy. So, for example, if you just met someone and you dump a shocking story of something that happened in your childhood or a past relationship on them, that is in a way manipulative. They are not the person you should be sharing that with. It’s not appropriate for the amount of time you’ve known them. This isn’t the way true, lasting intimacy is developed. It must be built over time, just like trust, if it’s going to have a solid foundation. Recognize the Difference Between Authenticity and Vulnerability. Being real isn’t the same thing as spilling your guts too early! You can be true to yourself and be authentic without oversharing. I’ve found that some people conflate authenticity with vulnerability, so let’s get really clear on this. Sharing too much too soon isn’t the same as being authentic and honest: it’s simply sharing too much too soon. I can’t say it enough: the key to healthy vulnerability is setting healthy and appropriate boundaries. If you want to create and nurture voluntary vulnerability in your life, you need to understand appropriate levels of sharing (this can include physical boundaries as well). Having good boundaries doesn’t mean building walls, it means building bridges by taking your time and trusting yourself to be truly discerning. People are always showing us who they are with their behavior. Are you paying attention? How you treat yourself has everything to do with how other people treat you. Self-love fuels healthy and voluntary vulnerability. When you really focus on treating yourself with kindness and compassion and take impeccable care of you, it will be natural for you to be voluntarily vulnerable rather than indiscriminately vulnerable. That’s because when you accept and love all of you, you don’t worry so much if someone else isn’t going to. Your ability to draw boundaries can inspire you to step into a place of openness with confidence. Give Yourself a Break: This Takes Practice! This is deep work and again, it takes time. But it is so worth it because cultivating voluntary vulnerability creates real bonds and lasting intimacy and I so want that for you. If you like this episode, do me a favor, share it with the people in your life. If this brought any value to you, please share it on your social media platforms. Remember, I am going to be starting my live YouTube show in April, and I couldn’t be more excited! So if you’re not subscribed to my channel yet, please do so right here. I’m going to be taking your questions live once a month on The Terri Cole Show and I cannot wait to see you there! I hope you have an amazing week and as always, take care of you.